Here are a few resources we hope will help you through this hectic – but happy – holiday season! SC Shop - Give local! Shop online for SC books, art, clothes, and food ... plus holiday gift baskets. SC Christmas Tree Farms - Find out where to cut your own tree, plus tree care tips and info on living trees. SC Churches and Temples - Learn where you can share the spirit and meaning of the season with others. SC Community Service Organizations - 'Tis the season to give! Learn how you can help the non-profits working in your community. SC Holiday Lights Festivals - From the Lowcountry to the Upstate, everyone's showing their spirit! SC Hotels - Where to send the in-laws. Umm, we mean, great guide for friends and family members in town for the holidays! SC Malls and Shopping Centers - Sooner or later, it has to be done! SC Resources for the Homeless - Thousands of South Carolinians are homeless this winter – find out how you can lend a helping hand. SC Restaurants - Too many cooks in the kitchen? Find out where to get a good meal. 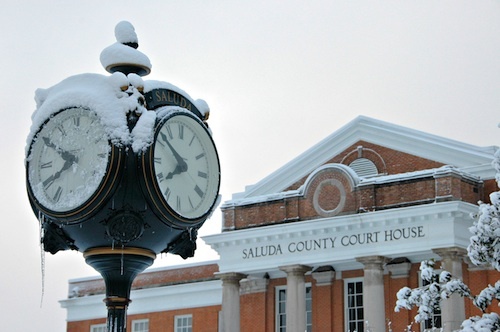 This wintry scene shows the Saluda County Court House. Its grounds are home to several monuments celebrating the area's special history. Known first as Butler County, the county was renamed Saluda two days after its incorporation, in honor of the river which forms its northern border. The word "saluda" comes from the Cherokee Indians and means "river of corn." The Saluda town clock stands in front of the court house. The Travis and Bonham monument, which honors heroes of the Alamo (and Saluda County natives!) William Barret Travis and James Butler Bonham, stands on the grounds as well. On the west side of the court house, a tablet details the Saluda Old Town Treaty. This document was signed in 1755 and stated that the Cherokee Indians must recognize the sovereignty of the King of England over all Cherokee lands in South Carolina. SCIWAY thanks Ron Watkins of Saluda, who took this picture in February 2010. Send us your SC pictures and the next photo of the month could be yours! As always, please be sure to check out our complete December calendar. Also, remember that all of our event calendars, for every month of the year, are available on SCIWAY's website 24/7/365 – just go to https://www.sciway.net/calendar.html. Holiday Hope is a community outreach event where a first-class Christmas meal is prepared and served to 6,000 people in Greenville County. Gifts are distributed to needy children as well. The event will be located at Redemption World Outreach Center. Register to receive help – everyone is welcome! Or if you'd like to help, sign up to sort toys, serve food, or help with transportation. Dec 2-6: FestiVELO de Charleston - Holiday festival of bicycles for families - camping plus lots of food! Dec 3-4: Holly Hill Christmas Prelude Festival - Parade, rides, yard sale, craft show, Christmas tree lighting, ice skating, and snow! Dec 5: Holiday Parade of Lights - 12th Street in Cayce & West Columbia - all entries will be lit! Please click here to find links for ALL December events.